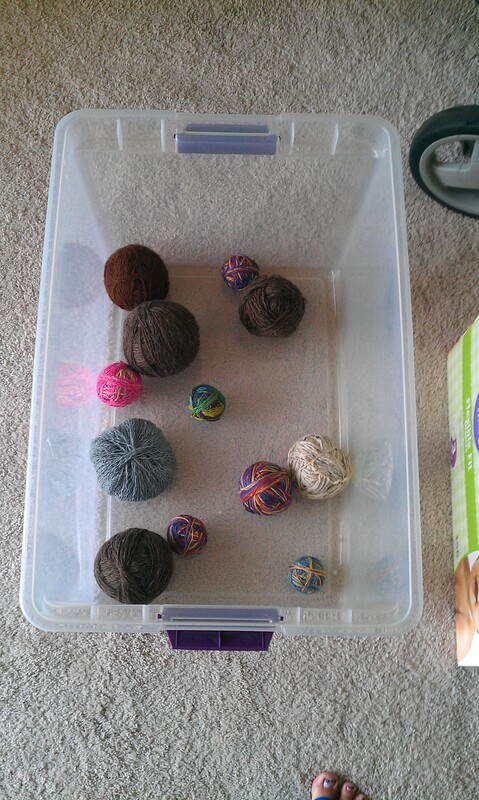 Nice mostly empty bucket with reclaimed yarn, yes? A couple projects did end up getting tossed, due to the fact that I think moths might have been at them, and it just wasn’t worth it to risk my stash! In the spirit of trying to finish up projects that have already been started, I re-filled the tote (the one I had just emptied) with projects (I took pictures first!) 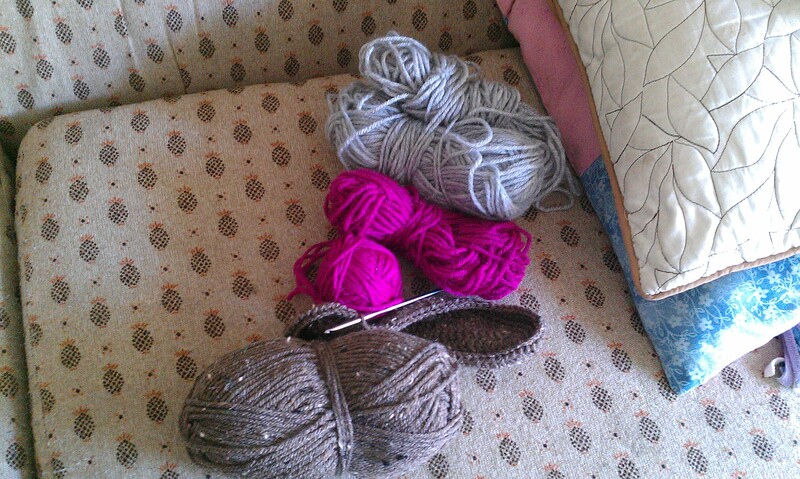 and have decided that I am going to knit/crochet only from that tote until it is empty, and then fill it again. 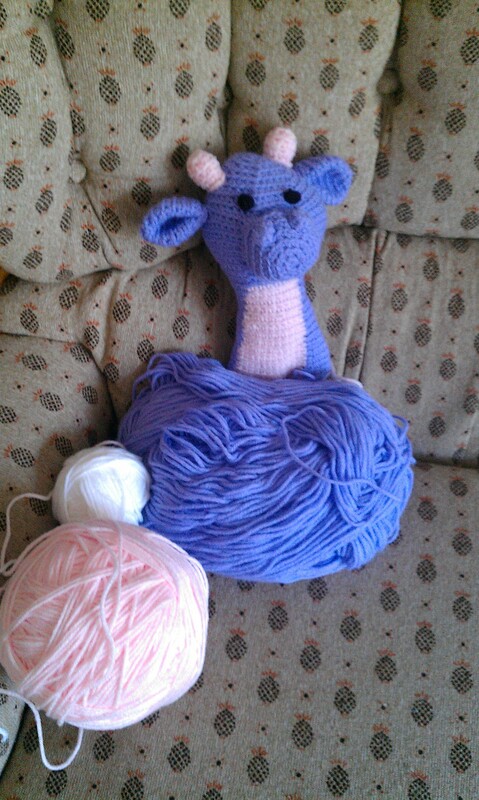 It includes mostly already started projects, with yarn for one new one, and once I get the supplies for one commission project, that will be in the tote as well. My hope is that this will give me motivation to get rid of my old projects, either by finishing or frogging – it forces a decision. 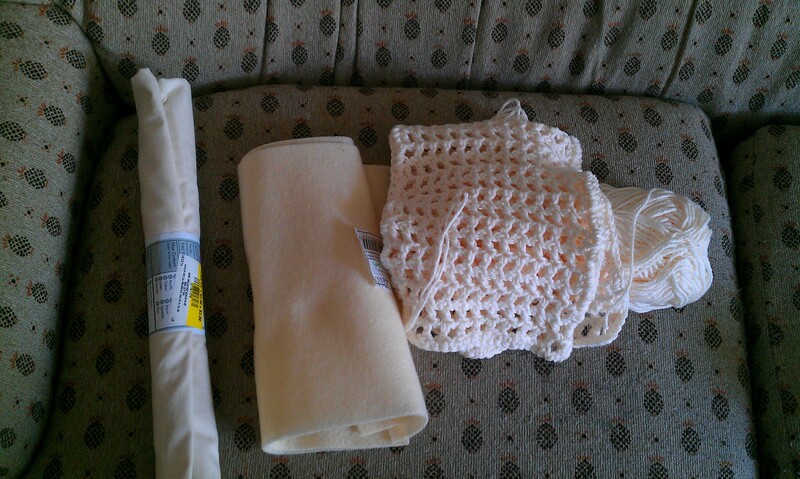 So, without further ado, here are the projects in my tote! I hope that I will be able to post finished pictures very soon! 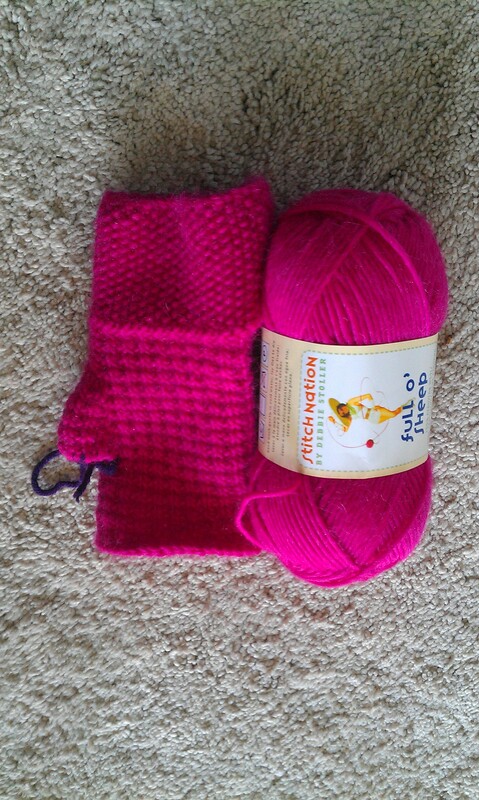 The Sock Yarn Blankie, by Shelly Kang (started in May of 2010), Owl Obsession, by Marken of the Hat & I, (Started April 2014), a scrappy blanket of five strands held together knit on US 50s that I have no pattern for, because i’m just making it up as I go along! 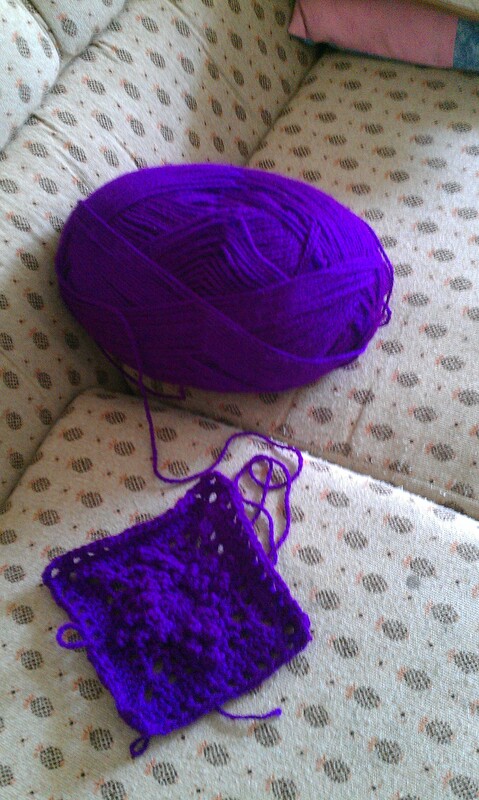 A Purple Crocheted Lace Baby Blanket, by Baby Dear (Which I so believed I wasn’t going to finish, I deleted it from my project page on ravelry!, and a square for an ongoing test that i’m participating in, so the pattern is not yet published. 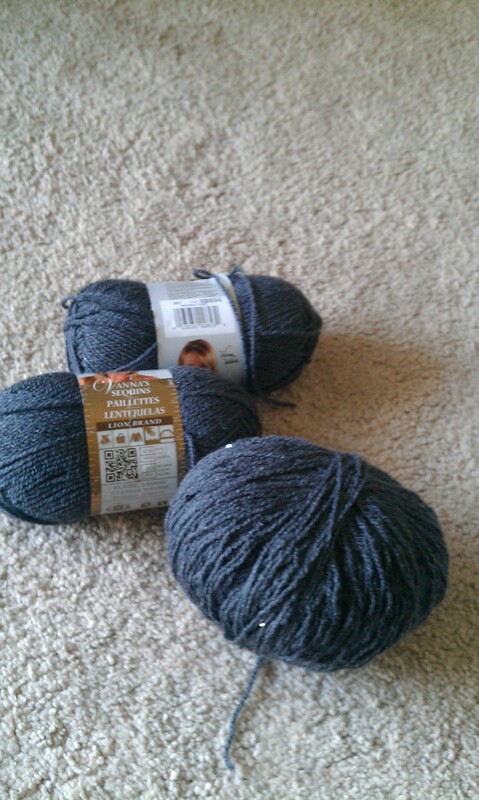 Last, but not least, projects that only need ends woven in, or blocking. 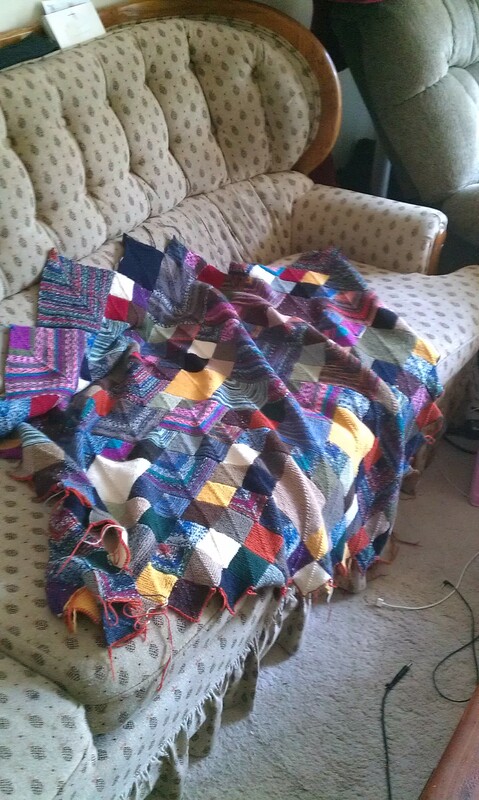 Hemlock Ring Blanket, by Jared Flood (Which is such a pain to block, but so pretty when it’s done.. 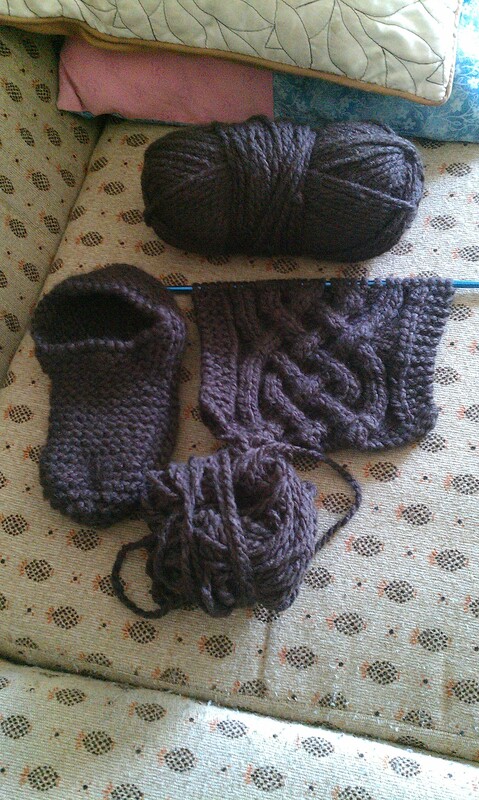 I just really, REALLY hate blocking this pattern. 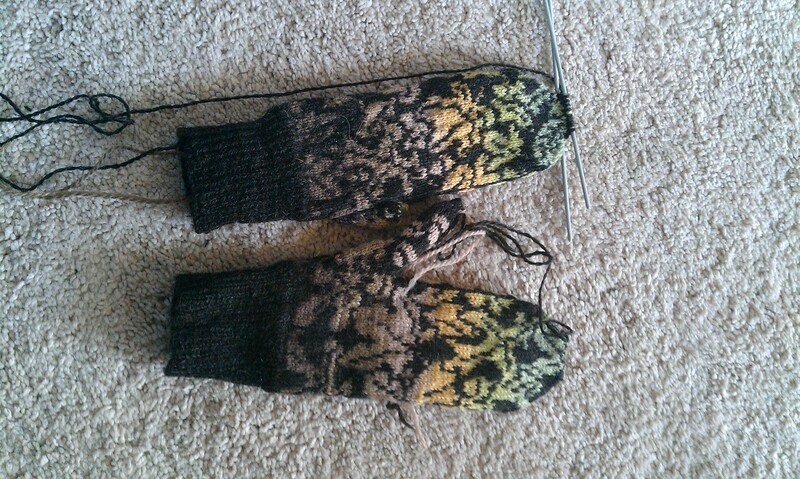 I made two of them before blocking one. 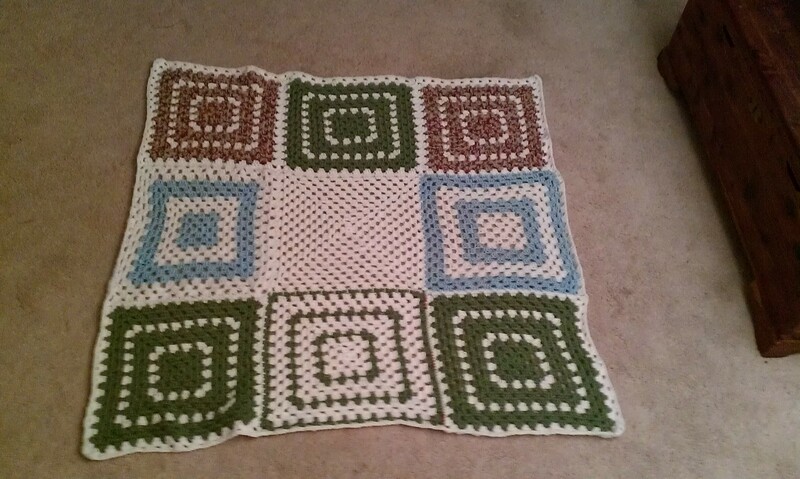 If I had waited to block the first one before making the second, i’d have never made a second one!) 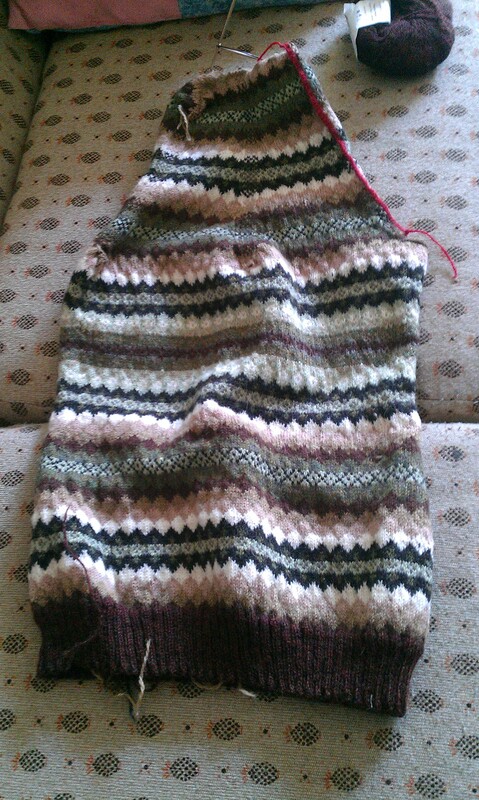 A Brunello Cardigan, by Amy Swanson, (This has been done for.. at least 3 years? Only requiring ends woven in and blocking. Such a slacker..), That thing that looks like unicorn vomit is a Lafayette Shawl, by Julie Farmer, and just the TARDIS portion of Bigger on the Inside by Kate Atherly, because I really wanted a TARDIS scarf, but not a shawl..
Keep in mind!! These are NOT (I repeat, NOT) all of the projects i’ve started – just the ones i’m actively trying to finish in the near future! Phew! 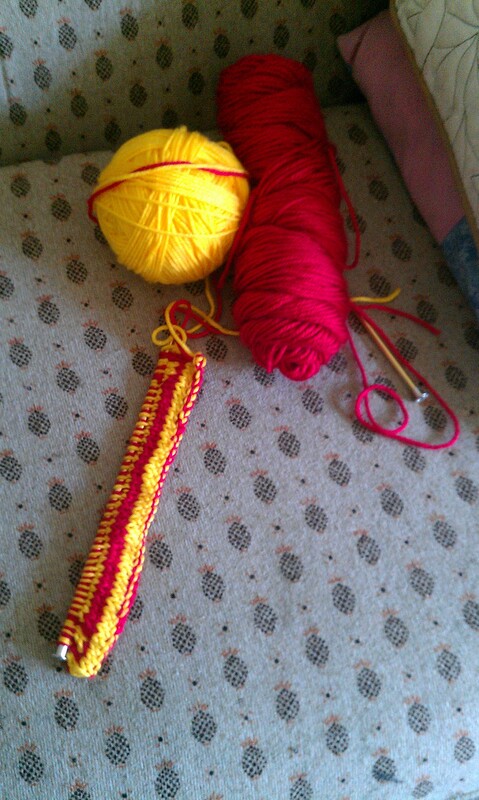 How many projects do you all have going on right now? Previous postSo.. 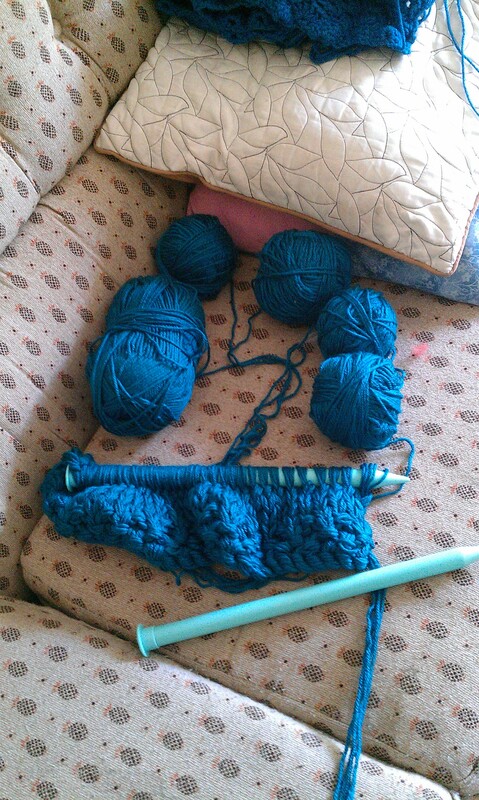 I have a spindle and fiber.. How do you actually SPIN yarn? I know.. 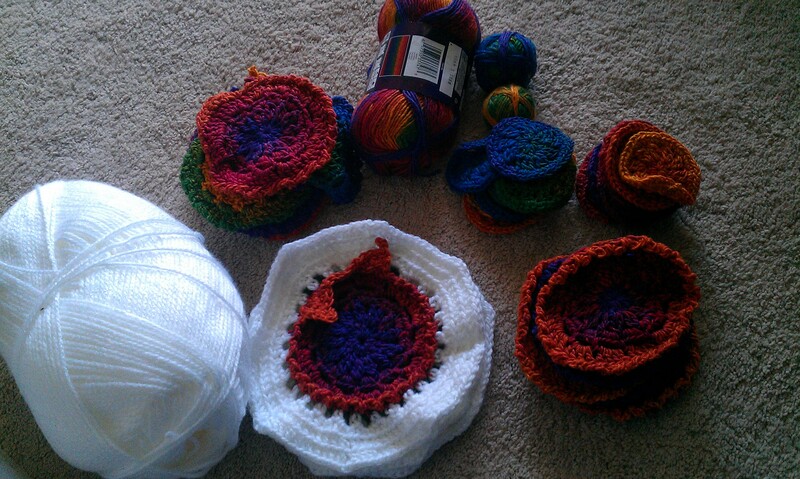 I don’t like to, but I did a “flash your stash” in April, and realized that probably 1/3 of my stash was actually active projects.. about 35 WIPs. My goal is to have that tote that I showed be the only container for active projects. That way I can still have.. 15 or so, but not SO many! How many active projects do you have right now? 🙂 I always say I won’t start new projects, then I just get so excited when I see pretty new patterns on Ravelry.. I’m trying really hard this time!